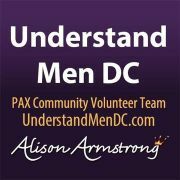 The Understand Men DC PAX community is led by a group of volunteers committed to share the education of PAX Programs in Washington, DC, Baltimore and Northern Virginia. Our lives have been profoundly impacted by this work, and we host free events to generate interest in PAX workshops in Washington DC, Baltimore and Northern Virginia. PAX Programs is in the business of educating women about men. PAX, the Latin word for “peace” - and also an acronym for Partnership, Adoration and Xtasy - creates peace between the sexes by providing unique and immediately useful information to women and men. Women will rediscover MEN with compassion, understanding and the ability to get what you need from them with less effort and more satisfaction for both of you. PAX’s flagship program -- Celebrating Men, Satisfying Women® -- is a weekend educational workshop for women, which transforms the way women relate to men. 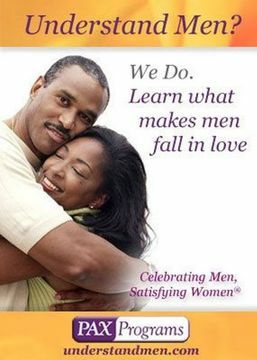 It facilitates the reconciliation many women are seeking with men and outlines the skills necessary for women to realize powerful, satisfying relationships with all of the men in their lives. The Understand Men DC community also hosts co-ed events so men can join us and learn more about women and learn tools to experience more rewarding relationships with women. We hope to see you at an event!